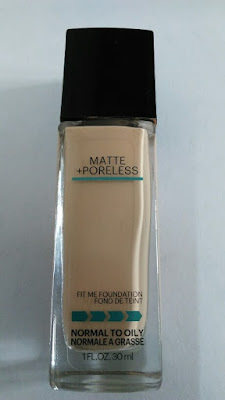 Maybelline Fit Me Matte Poreless Foundation is one of the most raved foundations of 2016, specially for oily acne prone skin but somehow I could not review this last year, since I got my hands on this last October along with the fit me concealer. Finally after trying this foundation for few moths, using it off and on, I am all here to share my views on this. 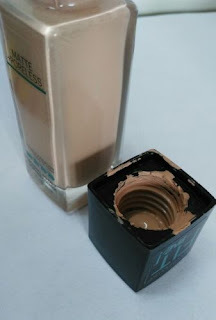 Before we move further, lets take a look at the claims of this Maybelline Matte Oil free Foundation For Acne Prone Skin. 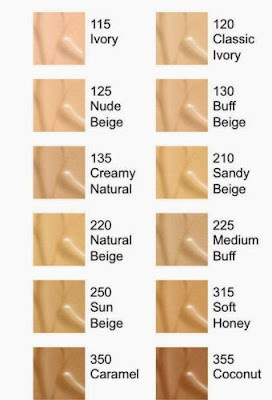 Want the perfect foundation fit? It's all about matching skin tone and texture. Mattifying liquid formula ideal for normal to oily skin. Mattifies and refines pores and leaves a natural, seamless finish. PRICE - Rs 525/- for 30 ml. The packaging of this oil free liquid foundation is very simple but still it looks quite attractive to look at in this sturdy sharp glass bottle unlike regular edge ones. The only drawback is it comes without a pump, which is surely a big con of this since now even the simplest of products these days come with a pump dispenser for easy use & hygiene measure and for foundations its a must because it makes the job of application much easier, so surely this is something missing. The consistency of the foundation is medium, more towards the liquid side. It appears truly matte to look at. I normally dispense just half a pump of it and apply dots all over focussing on scars and blemishes specifically. 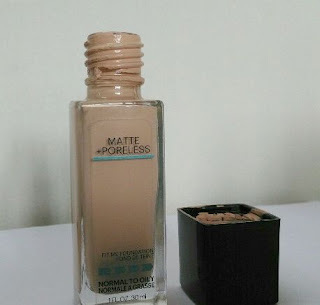 The foundation blends with little difficulty since I have dry skin in winters specially and it takes me lot of effort to blend foundations for a natural finish and this being a matte one requires even more effort. I have tried this with beauty blender, real techniques sponge, Sigma F80 Kabuki Brush and even with my fingers and it works best with fingers since feathery light touch of fingers warm up the product making it much easier to blend. 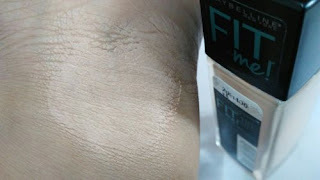 Coverage & Poreless Finish of this Maybelline Fit Me Foundation. Coverage wise I feel the foundation is pretty good, since it covers most of my acne scars quite nicely with just one thin layer, though I dont have much scarring, just little acne scar here and there. But I am not staisfied with the poreless claims of this. The foundation does manage to blur pores little bit making them appear less noticeable but it does the opposite on areas with dryness since it just clings to dry patches eventually focussing my pores more. Based on this result, I think this would be a great foundation for oily acne prone skin since it does a wonferful job in mattifying skin along with reducing appearance of pores but if you have dry skin, this can actually give oppsoite results and I think thats pretty much obvious with the name Matte + Poreless. Though another dewy version of this, dewy + smooth, but its not available in India as of now. I have heard great reviews of that as well and I think it would be a great foundation for dry acne prone skin but will have to wait till its launch in India. Overall I would say this Maybelline New York Fit Me Matte Matte + Poreless Foundation is a great daily foundation for people with oily acne prone skin since it can beautifully mattify your skin giving you nice buildable coverage but for people with dry skin, this can make your dry skin look even more drier, unless you layer your skin with a real hydrating moisturizer prior to application of this, or try getting your hands on the dewy version of this. Great for oily acne prone skin. Blurs out pores to some extent. Nicely covers acne scars, blemishes, uneven skin tone. Gives a fresh vibrant feel after application. Not for dry skin beauties. Clings to dry patches, highlighting problem areas even more. Can look cakier if not blended properly. 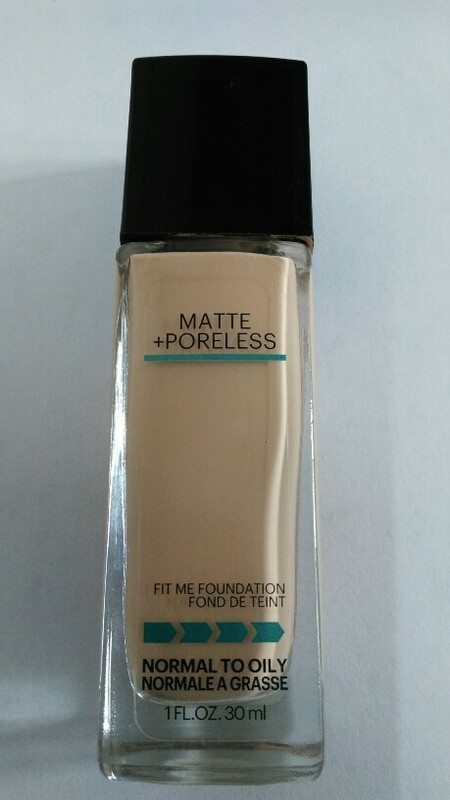 Labels: FOUNDATIONS, Mabelline Fit Me Matte Poreless Foundation Review, Makeup, MAYBELLINE, Oil Free Liquid Foundation.